Smirnoff Vodka now has a cinnamon-spiced mix with gold flakes. You can drink the gold too. It looks great, and is exclusive to travel retail. The gold-etched bottle looks cool, and the flakes lie suspended. The drink was a hit during the trial run at Mumbai Airport, out-performing targets. Texts show that the practice of putting gold in alcohol dates back to ancient Egypt. Them weird Pharaohs. 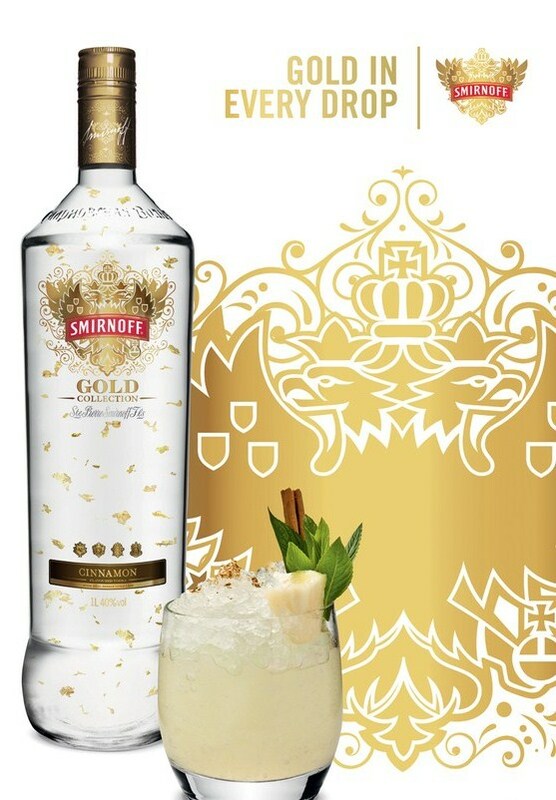 A recommended serve: The Golden Delicious – Smirnoff Gold mixed with apple liqueur, cinnamon and a dash of maple syrup. I think i’ll infuse some cinnamon into my Baad Apples™ cider. Like all Smirnoffs, it’s triple-distilled, 10 times charcoal-filtered. The product comes in a one litre bottle at 40%abv, with a recommended selling price of US$36 (RM108). This entry was posted in ~ Booze news / new products ~, ~ Duty-free / rum-runners ~, ~ Liquor ~ and tagged airports, Diageo, duty-free, new product, travel retail by Deep. Bookmark the permalink. like real gold flakes ? where can you buy this and have it sent to australia? Are u serious? Cant u get it there? jaclyn is right. You can only get it at Duty Free. I missed my chance when I should have bought 2 bottles of that instead of some fancy orange truffle baileys. We got drunk on the Vodka Gold on Mt Everest. Was fantastic lol. Best stuff I’ve had in a while. Mixed it with Sprite. We bought some at the duty free in Aruba. The taste is ok, but it has gelatinous lumps in it. My guess is it has something to do with how they keep the gold suspended in the liquid instead of it falling to the bottom of the bottle. The problem is it is a disgusting texture to drink. Who wants lumpy vodka? So true. It feels absolutely gross in your mouth. I’ll be giving the rest away. Yeah, i got some bought back to Australia via duty free and it had gelatinous lumps in it. I think you are correct, it’s to stop the gold from sinking. Unfortunately it completely ruins it as a drink. Instead of this get the Smirnoff Espresso and sip it straight, lovely!